The suspected illegal airstrip about five miles west of Santa Fe, Rupununi. 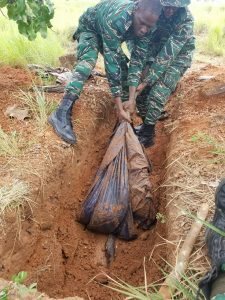 An illegal airstrip and several items were discovered in southern Guyana on Saturday, but no one has been arrested, Chief-of-Staff of the Guyana Defence Force (GDF), Brigadier Patrick West said. He said the illegal airstrip was located about five miles west of Santa Fe, a large scale agricultural area outside Lethem, Rupununi. West said no narcotics were found at the scene. 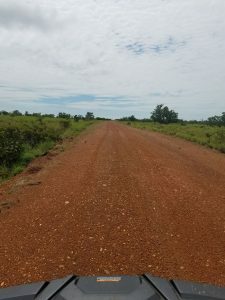 The GDF said a patrol in the Hinterland, while conducting a reconnaissance mission Saturday morning discovered what appears to be an illegal airstrip. 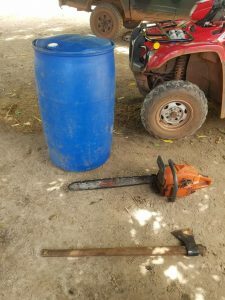 The soldiers also found several dug out trenches, one chainsaw, fuel drums, 12 abandoned camps, one axe and a quarter drum of aviation fuel at the location, the GDF said. The Chief-of-Staff explained that the dug out trenches might have been used as a storage area. “Authorities are conducting a thorough investigation, as the alleged find represents the challenges faced by our security Forces in the Hinterland. Over the past few years several illegal aircraft were seized by the state,” the GDF said. Guyana’s waters and later released. Days later, the United States busted a St. Vincent-registered vessel with one of the biggest cocaine hauls in history. Several Guyanese, who were aboard, were taken to Puerto Rico where they were charged and arraigned. Earlier this week, Minister of Public Security, Khemraj Ramjattan said Guyana is still considered a drugs transshipment point.